Expansively luxurious and based off traditional English style furniture, this sophisticated nightstand is sure to grab compliments. 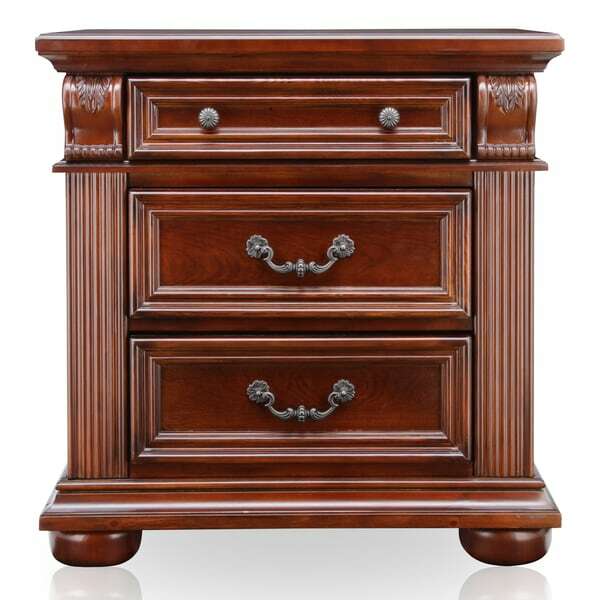 The brown cherry finish creates a warm and rustic atmosphere while emphasizing the multiple drawers. Dimensions 30.0 In. X 17.0 In. X 30.0 In. The nightstand is absolutely beautiful! It had a small ding in the bottom right side but I wanted to keep it so they gave me money off. It is great quality and you will love the first drawer with the lining for jewelry. I would recommend this nightstand. Had been looking for a second one of these for a few years. Very happy with this one. It matches the one we got in a bedroom set. My wife got that and I wanted one but vendor no longer sold it. The nightstand shipped quickly. It is a hefty well made piece of furniture. This was purchased as an extra item in addition to a bedroom set that we purchased. We are excited to receive the rest of the bedroom set and hope it is just as nice! Very pretty - good quality and quick delivery! I bought the entire set and i am so happy with it! First time to order furntiture online so i was nervous but it was a super easy transaction - thank you! Good quality pics, I perched the room , it made will look very rich and the quality is great , the bed easily put together,found a little scratch on the hed board some polishing take care of it . LOVE, LOVE, LOVE THESE NIGHTSTANDS, GREAT QUALITY!! Nice looking nightstand. Very sturdy. Arrived damaged though. Hopefully a new one can be sent. Love it. It was delivered damaged by UPS but overstock customer service was great and sent another one right away. The service was very bad and I still cannot get my bedroom set. They told me Friday delivery that they will be there 8am I went to work late an still now show. Not cool I will not be buying again from company. "Is this more red with brown undertones or more brown with red undertones?" It is more brown with red undertones. It overall very brown. It is beautiful and I think you will love it! I love my nightstand. Darn! I need one that's more red than brown.